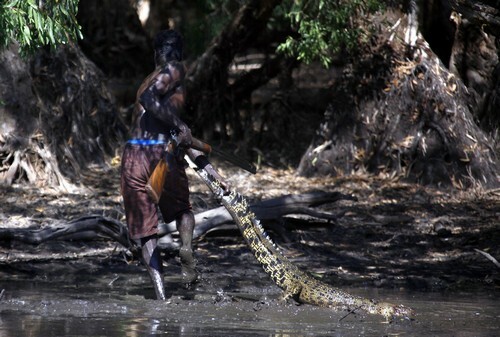 Aboriginal hunter Marcus Gaykamangu carrying an Australian native lizard called a goanna over his shoulder. 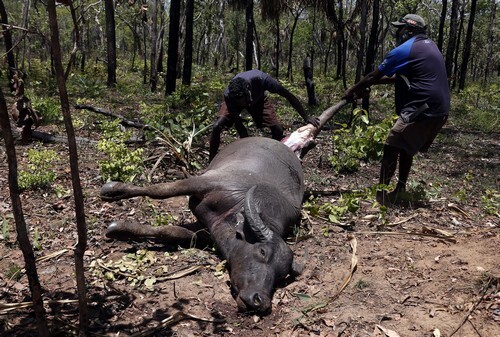 Their Arnhem Land reserve - closer to Bali than Sydney - covers an area of around 97,000 sq km, has a population of around 16,000 and access for non-Aborigines is by invitation only. As we moved into the territory, we found ourselves deep in a forest crowded by Australian paperback trees, the air thick with humidity but eerily silent save for the screeching of tropical birds, when Marcus shouts: "Look, crocodiles!" 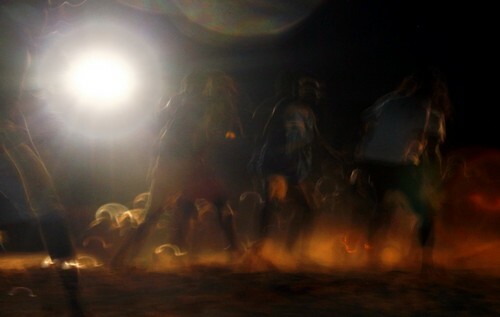 As a photojournalist, I'm a trained observer, but I can't see any crocs. 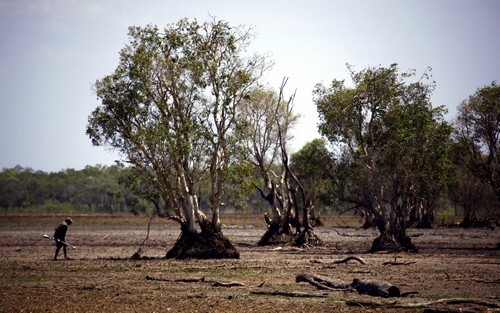 I can't see anything beyond mud and what little water is left in the small billabong (pond). 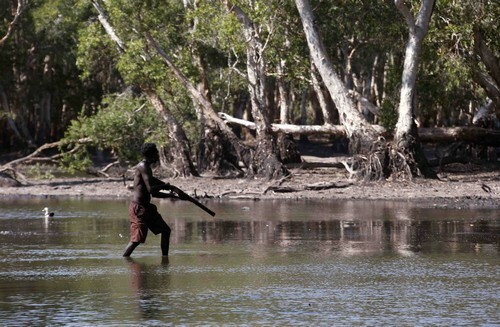 Aboriginal hunters Marcus and Roy, a father and son team, take off running past a herd of water buffalo and by the time I catch up, Roy is standing ankle-deep in murky water, his shotgun pointed at the surface. Hang on a minute: Wasn't your son pointing at crocodiles in that water 10 seconds ago? Is this safe? Roy treads carefully as the water rises to his knees, seeming for a moment to lose sight of his prey. Then, in one swift action, he steps back, takes aim and shatters the Outback calm, and a crocodile, with a single booming shotgun blast. I am definitely not in Sydney any more. 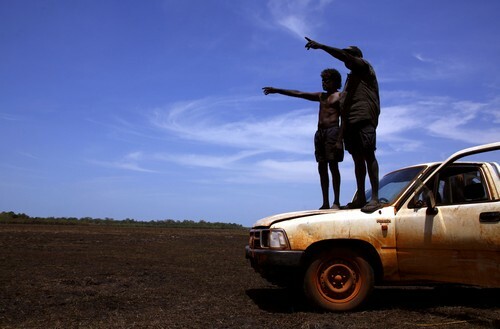 The Arnhem Land reserve, closer to Bali than Sydney, covers an area of around 97,000 sq kms (37,000 sq miles) and is home to Aboriginal Australians. 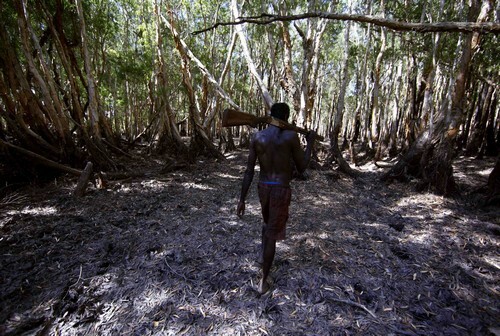 It has a population of around 16,000 and access for non-Aborigines is by invitation only. 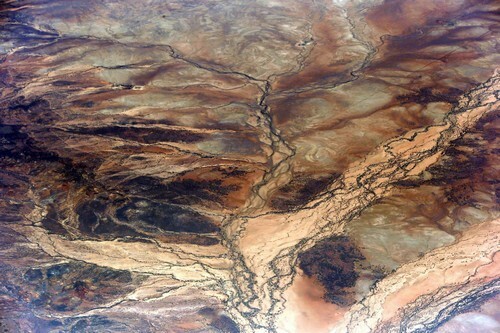 An aerial view of a river system in Australia's Northern Territory. 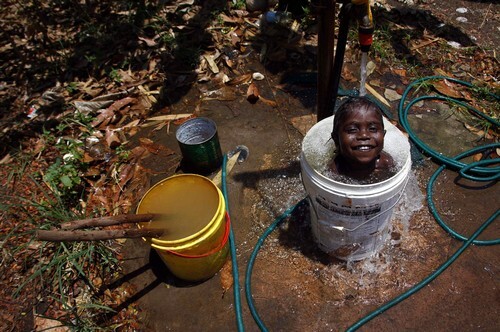 Four-year-old Gregory, grandson of Australian Aboriginal hunter Robert Gaykamangu of the Yolngu people, takes a bath in an old insecticide container. 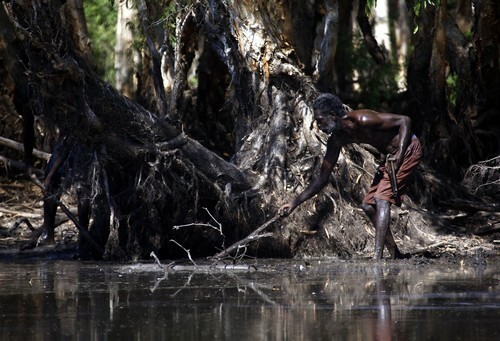 Australian Aboriginal hunter Roy Gaykamangu of the Yolngu people walks across a billabong while hunting a crocodile. In one swift action, he steps back, takes aim and shatters the Outback calm, and a crocodile, with a single booming shotgun blast. 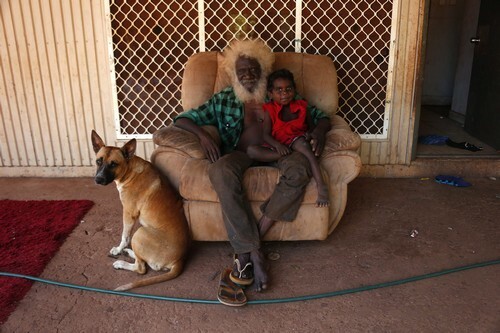 Robin Mildjingi and his grandson Gasier of the Yolngu people. 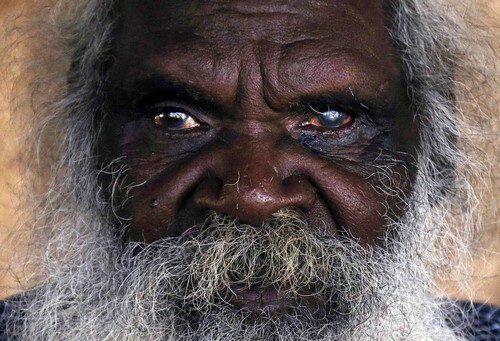 Seventy-six-year-old Australian Aboriginal elder Jimmy Burnyila. 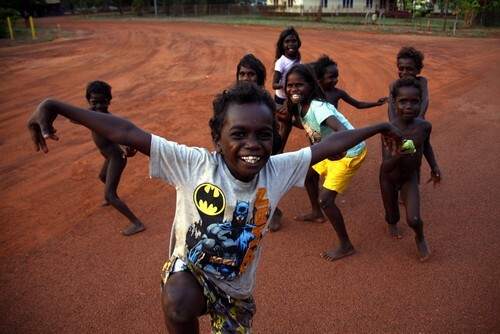 Australia's Aborigines are the custodians of the longest unbroken cultural tradition on Earth. The arrival of European settlers in the 18th century marked the beginning of a painful disenfranchisement. 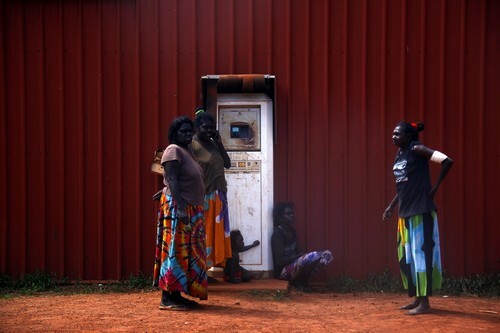 Today the majority of Aborigines live in abject poverty. 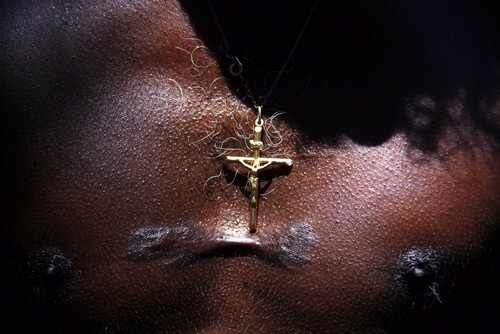 Australian Aboriginal hunter Bruce Gaykamangu of the Yolngu people wears a crucifix that sits just above his initiation scar. 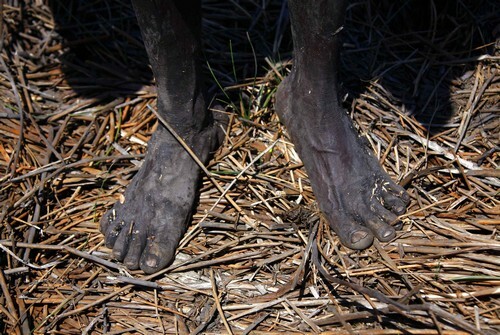 The bare feet of Australian Aboriginal hunter Robert Gaykamangu. 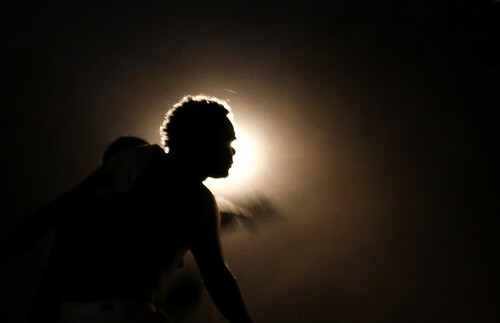 Australian Aboriginal hunter Robert Gaykamangu of the Yolngu people walks slowly while carrying a shotgun hunting Magpie Geese in a billabong. 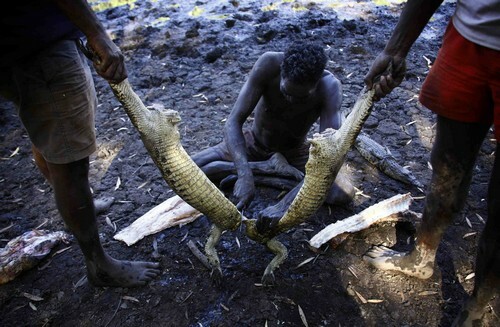 Australian Aboriginal hunter Marcus Gaykamangu of the Yolngu people lifts a baby crocodile above his head after capturing it. 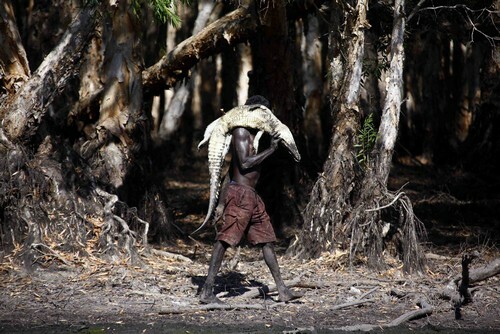 An Australian Aboriginal hunter carries his three-year-old son on his shoulders. 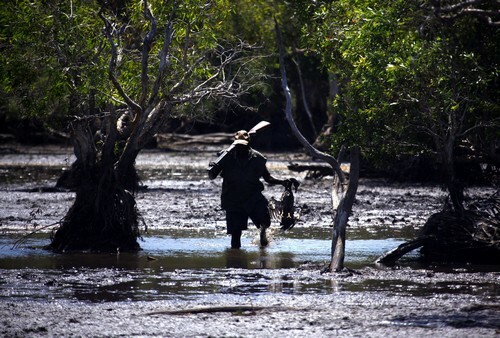 Australian Aboriginal hunter Robert Gaykamangu of the Yolngu people carries a Magpie Goose. 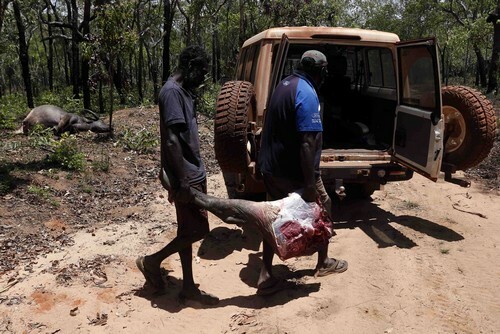 Australian Aboriginal Norman Daymirringu (C) and friend James Gengi (L) of the Yolngu people deliver a leg of a buffalo to a member of the community. 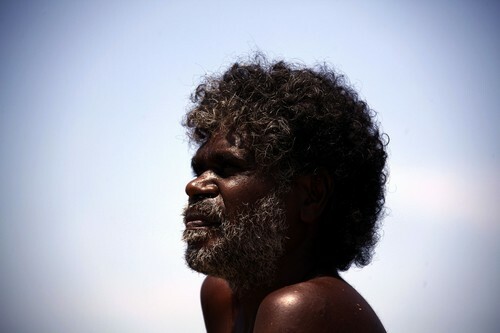 Australian Aboriginal hunter Bruce Gaykamangu. 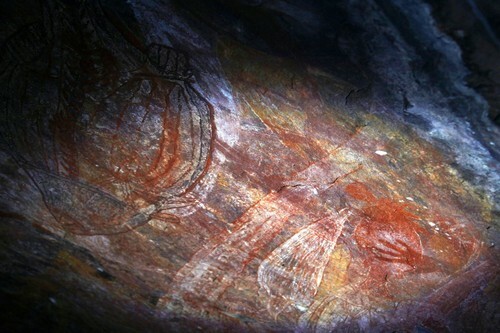 Australian Aboriginal rock art can be seen in a cave near the township of Jabiru located near Arnhem Land Reserve. Roy pulls the beast from the water, while Marcus keeps a lookout. Not far from the shoreline, the water starts moving. Suddenly, Marcus pounces and from just beneath the surface, he pulls another crocodile, this one a bleating baby. Wow, its over, I think. We can head off with a great catch and potential feast awaiting. Roy has other ideas. "It's easier to carry them without all that skin," he tells me. Any butcher would have been extremely impressed with the skill he showed at filleting the massive beast. The baby was carried out alive. 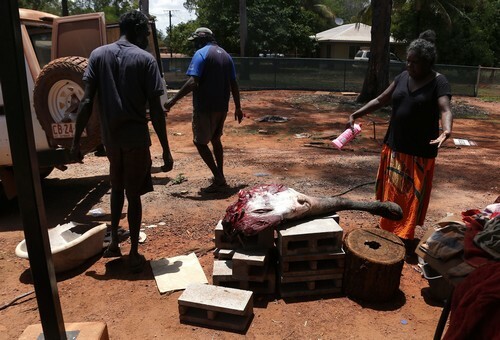 As we are leaving, Roy wraps the intestines in leaves, as nothing that can be eaten is wasted, and he and his sons walk the few kilometres back to the car with crocodile meat and a goanna lizard slung over their shoulders. 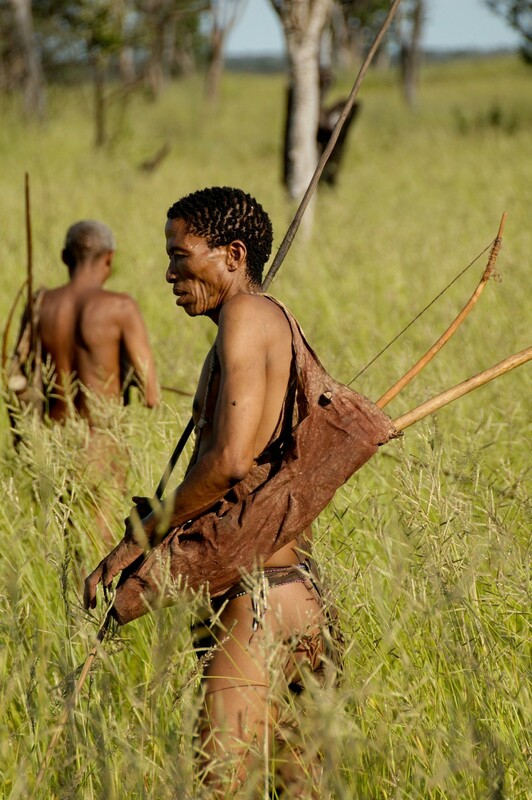 They hunt with bows carved from wood, use short poisonous arrows, and speak in a click language that is the oldest human language in the world. 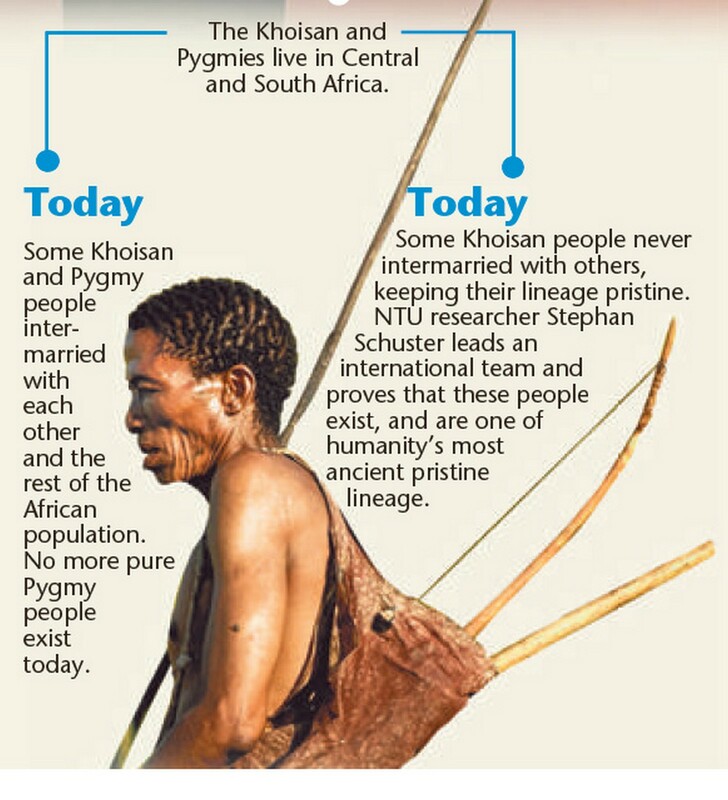 Now, an international team of scientists led by Singapore has proven that one of humanity's oldest "pristine" branches lies within the Southern African Khoisan people. 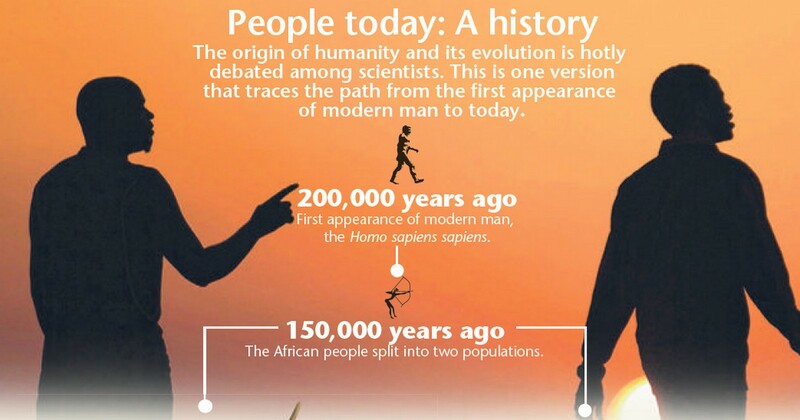 Since the birth of modern man some 200,000 years ago, a group of the Khoisan have married only within its tribes for the past 150,000 years, isolating itself genetically from the rest of the world. The ground-breaking discovery upends conventional wisdom that all people today are the result of human groups mixing with one another. 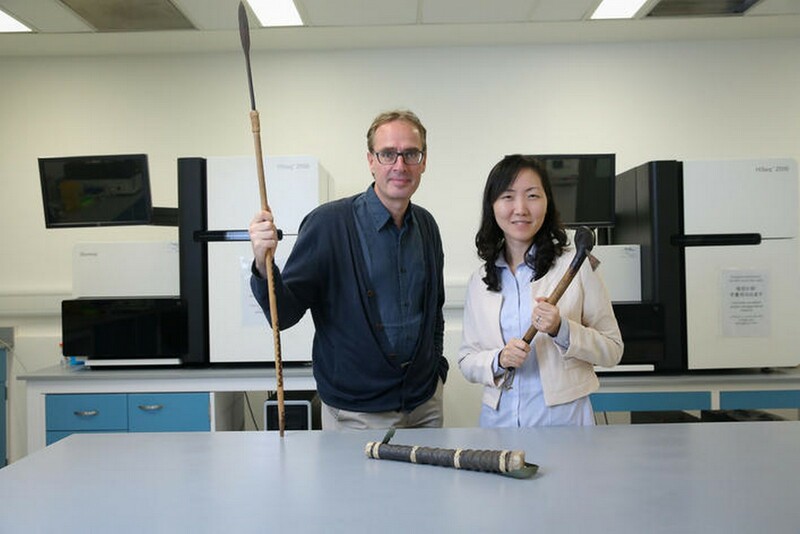 "Khoisan hunter-gatherers in Southern Africa have always perceived themselves as the oldest people," said NTU's Dr Stephan Shuster, who led the research. 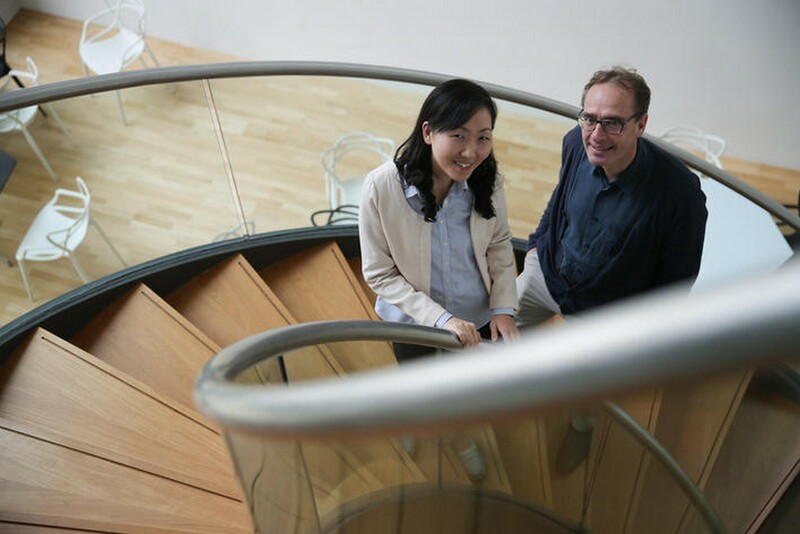 Professor Stephan Shuster (left) with co-researcher Kim Hie Lim (right). 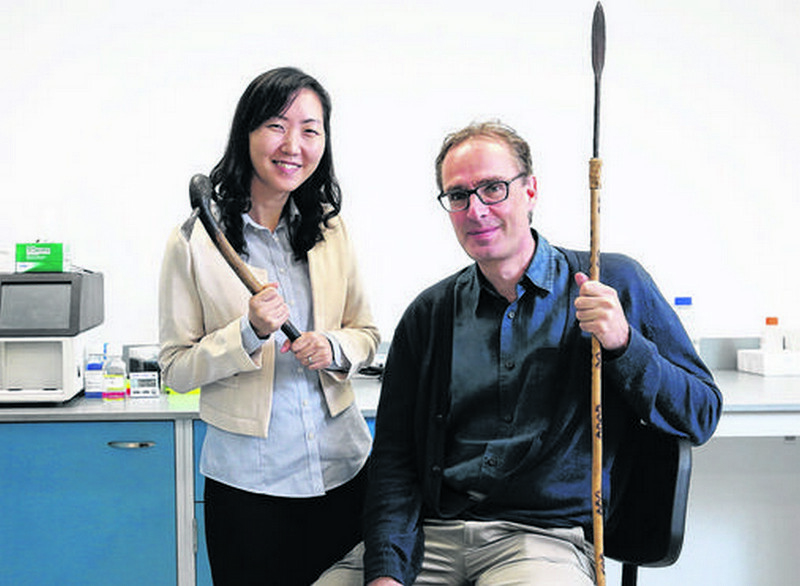 The six scientists from Singapore, Brazil and the United States made the breakthrough after sequencing the genomes, or genetic make-up, of five living Khoisan tribesmen. 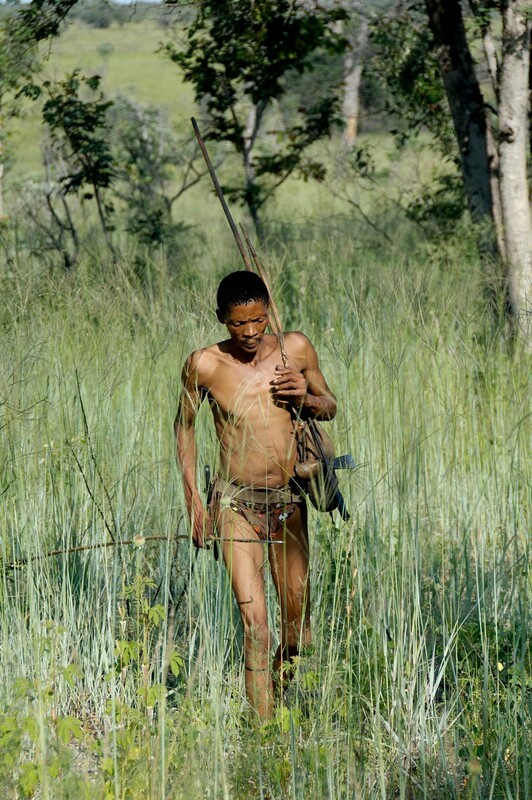 The high-quality genome sequences obtained from the Khoisan tribesmen will help researchers better understand human population history. 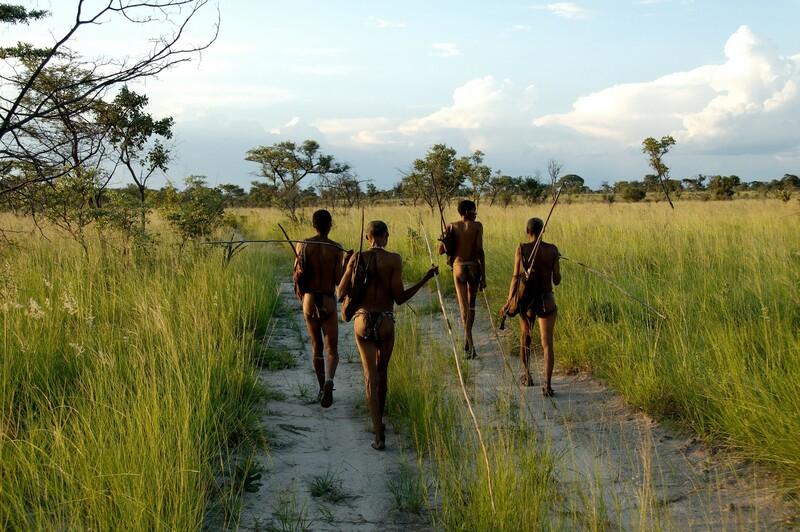 By comparing the genetic sequences of modern ethnic groups to those of the "pristine" Khoisan, for example, scientists can trace each group's ancestral lineage. 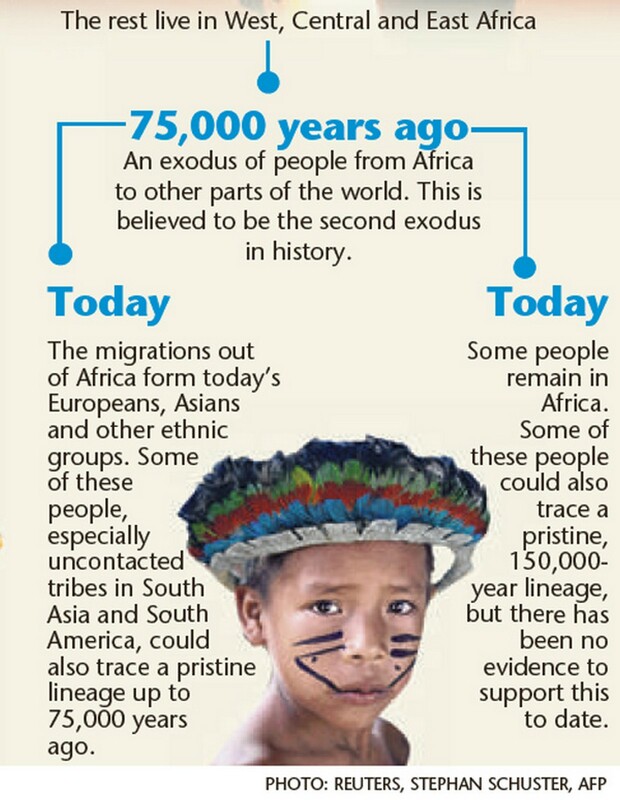 Dr Kim said the Khoisan were also among the most genetically diverse people in the world. Despite looking similar to one another, some of them are as genetically different from one another as a European is from an Asian. The Khoisan's diversity indicates that they made up the majority of living humans for a very long time, said the scientists.